File Note: Strictly Confidential - Authorised Personnel Only. Subject: James Bond. Description: Age 13. Dark hair; blue eyes; tall for age; surprisingly strong; fluent French, good German. Essential components: A Mediterranean mystery. One kidnapped girl - feisty, blond, superfit Amy Goodenough, sister of James' best friend Mark. One villainous pirate - Zoltan the Magyar. Mysterious Latin-speaking men lurking near Eton. One fast car. Above: British 1st edition Puffin paperback. An Eton boy's family disappears at sea. James uncovers a shadowy society operating in a hidden corner of the school. And far from England, in the bandit-infested interior of Sardinia, a sinister Italian Count has built himself a mountain fortress. Is there a connection? 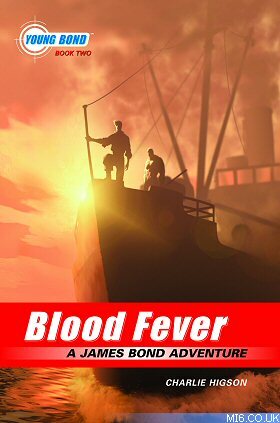 Young Bond is about to find out - and face a lethal group of villains beneath the burning Mediterranean sun. Above: American hardback Miramax Books edition (final). Whilst part of the Goodenough family are spending time in Mediterranean on their yacht, pirates attack under the guise of being in distress. Unlike regular pirates they are not interested in stealing the vessel and raiding the safe, all they want is a small silver statue. Everyone except the women onboard are killed, and in scuffle the disgruntled daughter stabs the captain leaving him mortally wounded. After already spending sometime at Eton, Young Bond is finally getting to grips with the school and its traditions. However, there are still those more than willing to pick on James and his friends. Always wanting an adrenalin rush, Bond is part of the “danger society”. It is during one of the society’s meetings that things start to go wrong, as one of the members has been spotted trying to attend the meet; leaving each man for himself in a race to get back to their rooms before they are all found out. During the rush back, Bond hears people talking in Latin and finds his way into a strange room with an eerie painting. Not having time to hang around he races back, only to arrive just in time. Bond's Aunt is going overseas for a while and will not be able to look after him over the vacation period, but the youngster's luck is in; the school is going on a trip to Sicily. James goes with them under the proviso that he can leave the trip part way and see his Uncle Victor and Victors “friend” Polyponi. Whilst swimming, Victor is visited by Count Ugo and invited to his mountain fortress. Polyponi is excited, however Victor believes the Count to be a fraud. Meanwhile the pirate, Zoltan, is taking his treasure including his captives to Ugo. Its here that the Count decides to kill the teacher and take Amy for himself. Later, during a visit of the fortress, Bond decides that something is not quite right. After a long street festival in the village below, where Bond meets his friends from Eton, he decides to sneak back up to the fortress. Whilst back at the stronghold he learns what Ugo is planning, and that Amy Goodenough is being held against her will. James tries to rescue her, but fails and is caught by one of his teachers at Eton who is in on Ugo’s sinister plot to steal art work. After a poor interrogation attempt, the Count decides to torture Bond using natures biggest killer; the mosquito. Above: American draft hardback artwork (not used). Luckily for Bond he is rescued by a mysterious girl, taken to the safety of her village and nursed back to health. The people of the village and other settlements around the island don’t like Ugo, and an assault on his fortress is planned. However, before it can be put into action the plotters are attacked and only saved by the villain's henchman who has decided to switch sides. Zoltan decides that he is going to blow up the dam in order to destroy Ugo and his fortress, whilst Bond races to save Amy. Both of them succeed. The world can now sleep that little bit safer. "You fascinate me, James Bond. You have the mark of death upon you." "I can see it. Seven is also the number of death. I see you and I see the number seven and I see the figure of death. Death will walk by your side through your life." "Don't you worry about a thing," said Haight. "Let me sort everything out." So saying, he put a hand between Copper-ffrench's shoulder blades and gave him a short, quick shove. Copper-ffrench had only time to shout "Haight!" before he was over the wall and falling. Haight watched him hit the bottom. It seemed to take an awfully long time. "The penny drops," he said and tossed the flask of brandy after him. SilverFin, Charlie Higson’s first Young Bond novel published in January 2005, was one of the most talked about children’s books of the year, described by the Independent as ‘one of the publishing sensations of 2005’. In just 9 months the book has sold over 150,000 copies in the UK and is to being published in 17 other territories. 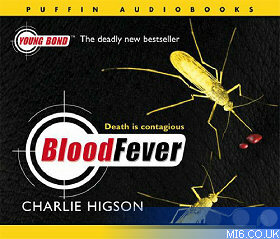 Charlie Higson introduced a teenage James Bond to a whole new generation of readers and his second book Blood Fever, published in January 2006 (UK), has the all the deadly ingredients of an equally exciting bestseller. With a colourful line-up of characters - including a young, hot-blooded Sardinian girl - a giddy, heat-infused setting, steeped in historical mystery, and an utterly gripping and action-packed story, the second Young Bond book promises to become, once again, the most talked-about children’s book of the year. 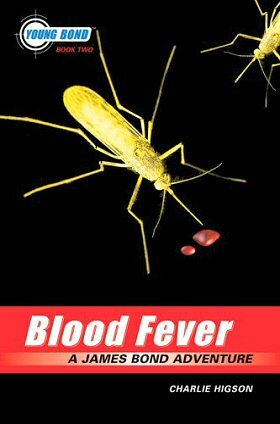 The abridged Blood Fever CD audiobook was released on 5th January 2006, the same day as the UK paperback edition, and will retail for £12.99. Author Charlie Higson continues to narrate the series.